I failed miserably at Saturday Sky, but maybe Saturday Temp will become a regular feature. Last Saturday around 8:15 it was 20º. 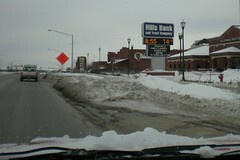 Today at just before 9:00 it was 14º. 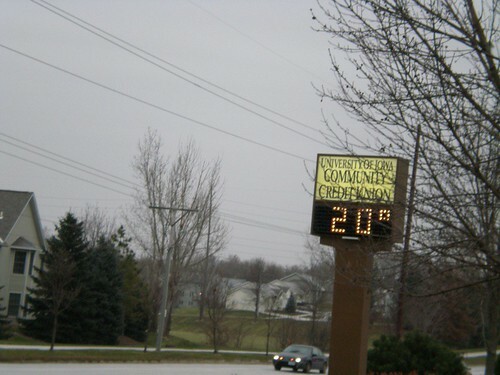 It warmed up in the afternoon -- when I went by the same sign around 3:00, it was 15º! While I was out this morning I stopped by Crazy Girl to buy some size 10.5 DPNs to use in making this hat for my niece. And some yarn just happened to come home with me. 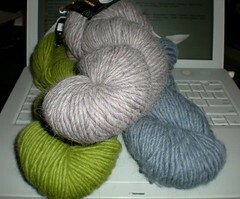 Three skeins of Cascade Pastaza for a Ryan's Hat for me. 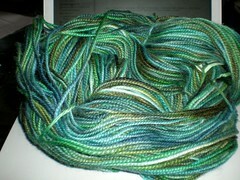 And a BIG skein (8 oz/325 yards) of High Prairie Fibers Big Horn, in Evergreen. This yarn was hand-painted for Crazy Girl (says so on the label!). The greens are a little bluer in person. I've been working on Honeybee and will have pictures next time. I also cast on for my niece's hat. Extra bulky yarn (Blue Sky Alpaca Bulky Hand Dyed) and size 10.5 needles supposedly means fast knitting, but each stitch seems to take me longer. However, there aren't as many stitches, so I guess it works on in the end! Mmm...Blue Sky Alpaca Bulky Hand Dyed? Sounds quick and beautiful! Oh, the greens as pictured are fabulous! Heh, we never hit that warm today. 14 degrees sounds nice. I went to the Yarn Barn today at 4:30 and it was close to 80 degrees and humid. This didn't stop me from buying Lamb's Pride for felted slippers. Great yarn haul! I love the colors you chose for your Ryan's Hat. How has it been adjusting to the cold temps? I remember the last Christmas I spent at home I was cold the whole time-even wore mittens at times inside the house during the day. I'm with Courtney, it is hot here in Fl. 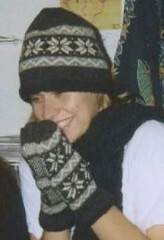 I wish I were there so I could wear some hand knit goodness! The green yarn is just beautiful. Purty yarn. I forgot for a moment you were back in the frozen North. It is in the mid-70s in AL. Your yarn is gorgeous! Cannot wait to see you model the hat - you're going to look so cute!